The Glamorous Life of a Housewife: Potty Time. Well, folks. We have embarked on the overwhelming journey of Potty Training. Levi has shown signs for a while that he is ready to go in the potty, but I have been waiting on a few things before we jumped in full-force. It's funny that it doesn't matter how ready for something a child seems and how you, as his mother, have a greater intuition about it. A gut feeling. I just didn't feel that it was time until now, and I am happy we didn't push him. That, or I was totally in denial and pretended he was a newborn. Levi will be 26 months old in a couple of days, and guys, he's .... a big boy. There. I said it. The other day, I got an overwhelming excitement for potty training! (And, um, a gift card burning a hole in my handbag.) So, I ran out to our new children's store in town and loaded up on gear. He's had his little potty for awhile, but he needed some little extras. 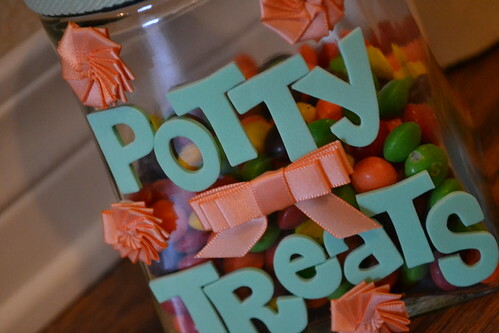 Ya know, potty goodies. 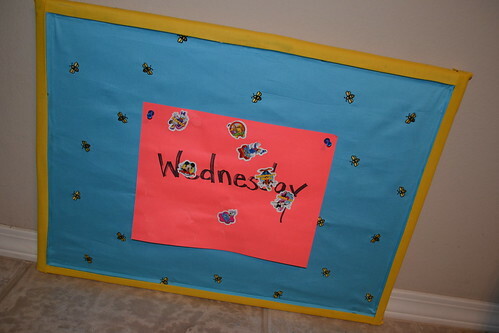 I went all DIY on myself and jazzed up the boring little bulletin board that we bought for his charts. 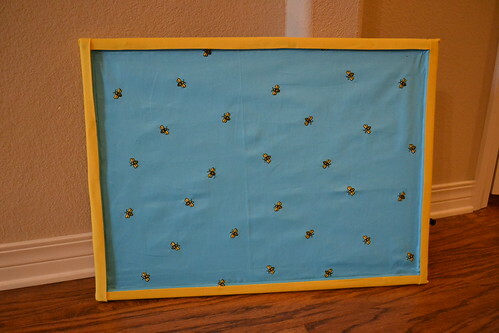 Bumble Bees! 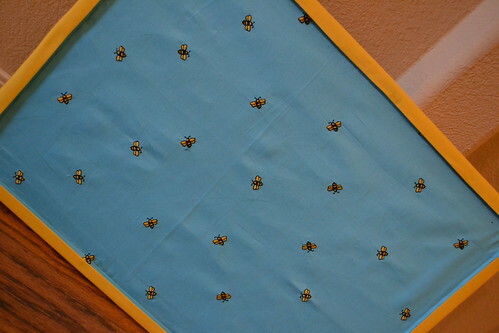 This fabric was some I had from back in my apron-making days and it turned out to be perfect because as we sit and wait for the tee-tee to come out, we count the bees! And the best thing about the whole thing? I go overboard on making things cutesy. But hey, it brings me joy. Happy, gaudy joy. I picked up the greatest invention of all time for my little man in our new adventure together. He loves it. It has 30, 60 or 90 minute intervals and when times up, it lights up, plays a happy little ditty, and Levi screams, "IT'S POTTY TIME!!" with wide eyes and a big smile. After that, he's gone like the wind to the potty. So funny. It's like pullin' teeth trying to get him to take it off at nap and night time. Dude loves the thing. I know a lot of people have different ideas of what to do while the child is on the potty. 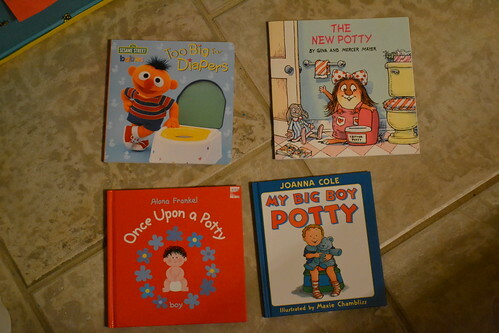 For us, we keep the potty in the bathroom at all times and when he's sitting there waiting to go, we read potty books. It's WONDERFUL. After today, he basically has all of these books memorized, and it's great seeing him understand and relate what is going on in the book with what is going on with him. Every time he goes in the potty, he gets to pick out a sticker and put it on his chart, and then get a Skittle. Oh, it's like he's getting a hunk of gold and a banana split. He gets SO excited. We began this journey around 10am yesterday morning and it was an awesome 1st day! He had 7 successful potties and a handful of accidents, too. Every time he tee-tee'd accidentally in his big boy underwear, he would scream, "UH OH - I'M TOOTED!". Oh, so funny. He's a mess. A beautiful, precious, incredible little mess. So. Potty Training. Any golden tidbits of advice? P.S. My daughter was 2 when she could stay dry all night long, so she was potty trained at about 2 and 2months. My son was 2 1/2 before he could stay dry all night long and was day trained short there after. We have been potty training since July 4th weekend. It has been difficult, Hudson is very stubborn! He does really well at school (2 days) and when he is home with just mommy. But when the nanny is with him on Friday he gets shy and wont go! This week has been really good, he actually went #2 in the potty! I still put him in a pull up at nap and bed....he is just one of those overnight pee guys....we stop giving him liquids around 6 and even that hasn't really helped. My secret for going places with him is telling him we can't go "shopping" until he goes potty, this usually works. I also put the piddle pad back in the carseat just in case he had an accident in the car....it saved us last night! No golden advice, since I've only potty-trained one! I think you and I have similar approaches, though, with watching their cues to see if they're ready and also following your gut. No one else can tell when Levi's ready except for you and Levi and it sounds like you've got the timing just right! I tried P.T. with Bub twice before when I thought he was ready...kid couldn't even talk yet, LOL. This recent time stuck though, finally started talking, stubborn little booger. He cried and fussed, so an animal wearing underwear was a huge help for me. If Mr. Bear had to go pee, it was time for Bub to pee as well. I gave Reese's and a sticker for his reward in the beginning. He used a potty chair for about a week until he got the hang of it. Then his potty chair died (the seat got ripped in half - don't ask) and I fully explained and showed Bub. We have an oblong shaped toilet seat, but he's used the adapter just fine. Our stuff NEVER leaves the bathroom either, that's just something I can't handle. Another thing is...I have two sizes of underwear for him, but he has to have the bigger (4T) size. He'll have accidents in 3T, which is his pants size...I don't think he can get them off as easily and sometimes he'll have an accident while trying to get his underwear off standing right beside the toilet...rarely has one with the bigger undies. He's doing great though...after a week and a half, he was running in the bathroom by himself. I am using a diaper at naps and bedtime...gonna just wing it on that one. :-) Good luck Levi!!!! Good luck Whitney! 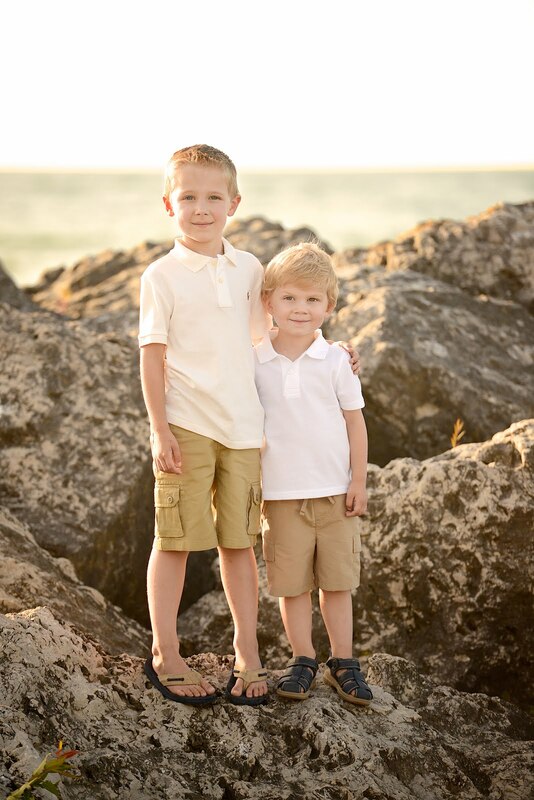 I am so glad that I get to read ideas and stories of various two year old boys potty training on blogs :) I have twin boys that just turned two...and I am overwhelmed! We are waiting a bit...I have one that is showing some signs of readiness...but then I have one that has no interest :) kids are so funny! Good luck! It sounds like you both are doing great :) Love the board! I had a girl first, then my son. They both were potty trained at different ages. 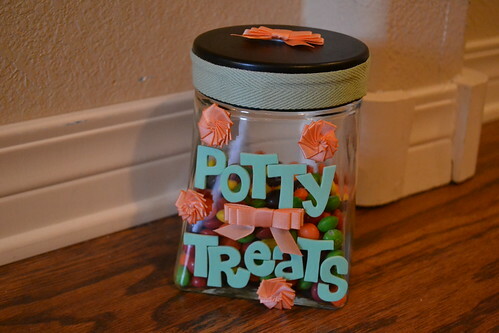 I also had a "Treat" jar and used it with the "littles" I watched and also potty trained. What Elizabeth said, that when they stay dry thru-out the night, they are ready, is true! It really does help. Good luck. No worries. No stresses! Where did you get the watch?! Hahaha I LOVE the watch. I don't know that the "night training" is all that accurate - it's an interesting concept that Elizabeth was talking about. I mean, maybe it helps, but my brother wet the bed until he was like 11. (dude, don't tell him I told you that.) hahaha. And he was definitely potty trained by then. I think genetics play a role in that. I'm interested to see how potty training goes with people who use cloth diapers. I hear it's supposed to be easier? (Who really knows). I have a friend who is almost due who is planning to cloth diaper and I am anxious to see how it works. The great thing about me being a little behind on the kid curve is I get to learn from you guys. Thanks for sharing! That chart and jar are SOOOOO cute! Oh, and I'm glad you keep the potty in the bathroom. I think I will do that too. My step sister doesn't, and the other day, we were all together at my moms house and her little potty was in the living room, or kitchen, and that little girl was just tee-teeing away. hahaha. Consistency is key, and that fancy watch of his will certainly help with that. Oh, and accidents are a necessary part of it - that's how they know what's going on down there, y'know? Oh, and to help them figure out when they felt like they needed to go, they'd tell me, "I feel the tickle." For whatever reason, that made sense to them - the sensation of needing to pee was like a little tickle in their lower belly. I asked an older lady in our church who had had 6 children if she had an tips, and this is what she told me, "When they go to school they won't be wearing diapers. Don't sweat it!". I"m in the process of potty training our 3rd (she was 2 in May), and it's slow going (but we also have a 2 week old!). My advice would be to go cold-turkey and hard-core...meaning, get rid of all diapers and/or pull-ups. If you're wishy washy about it, they'll be confused. Sounds like you're off to a great start!! All the best!! I have never heard of the potty watch. That's genius! I tried the "every 15 minutes" thing but could never keep track of the time. I ended up having him just run around with no pants when we were home. It got to where he was perfection with no pants but within minutes of putting underwear on him he'd wet them. Finally another mom suggested taking him to Target and letting him pick out his own underwear. He did (Thomas the Tank Engine) and it worked! I potty trained my son at 22 months, I didn't want 2 in diapers. I don't think I have any words of advice for you but hang in there. It's easy to say you won't get discouraged but it's more difficult when you see someone standing in your living room peeing on the carpet. This is why you deserve to dip into the potty treat jar yourself sometimes :) Good Luck!!!! I have no advice...just wanted to say that this post was adorable! 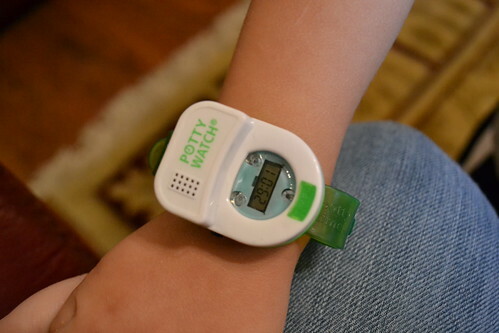 I hope that they still have the Potty Watch when I have kids! Wow! Levi is getting so big! omg I cannot believe that he is this little boy that has to go in the big boy potty :( It is incredible to see them growing up though. I can't say that i am looking forward to potty training with Peanut but I can say that I will cherish every single moment of it because it is such a big step and a milestone in their lives. 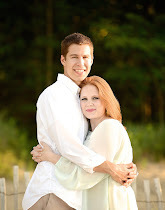 Congrts ;) and i LOVE your DYI potty supplies.